Instant Bingo is celebrating Halloween throughout the month of October with a $10, Trick or Treat Bingo Giveaway promotion for $10,000! This tournament promises to be a real treat, and to join the fun, simply deposit a minimum $50 per day between October the 1st and 30th. You’ll then be awarded one point for every $1 wagered on bingo and $10 wagered on slots! 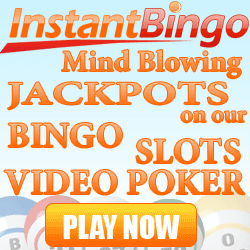 Each week there will also be an Instant Bingo raffle that will see the daily top 5 players who earned the most points being entered into the draw, with cashback, freespins, freechips and Amazon Gift Cards up for grabs! The raffle winners will be announced each Monday and the tournament winner will be announced October 31st between 8PM and 12AM EST, with the winner of the most games in the Trick room and the Treat room taking a cool $10,000 in cash! Happy Halloween!